Set in a grimy, highly mechanised Orwellian megalopolis, 15-minute short The Lost Thing revolves around a young, nameless boy. Whilst out collecting bottle tops he stumbles across the eponymous ‘Thing’, a giant mechanical creature that does indeed appear to be lost. The fearsome looking giant turns out to be quite friendly, and a bond quickly forms between the unlikely pair. By the feature’s denouement we discover the world the boy inhabits is not entirely as grim as it appears, and for all the hints of Kafka, Tim Burton, Hieronymus Bosch and Eric Blair a happy ending, of sorts, ensues. 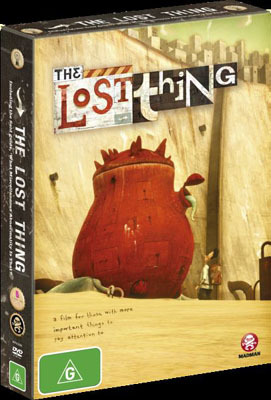 A curious musing on the nature of friendship and a thoughtful ode to those daring enough to gaze unflinchingly at the things unnoticed by others, The Lost Thing is a superbly executed piece of CG wizardry. The animation is truly stunning, and though comedian Tim Minchin is perhaps better suited to crooning songs about YouTube and loving Jesus his surprisingly earnest narration compliments the piece nicely. 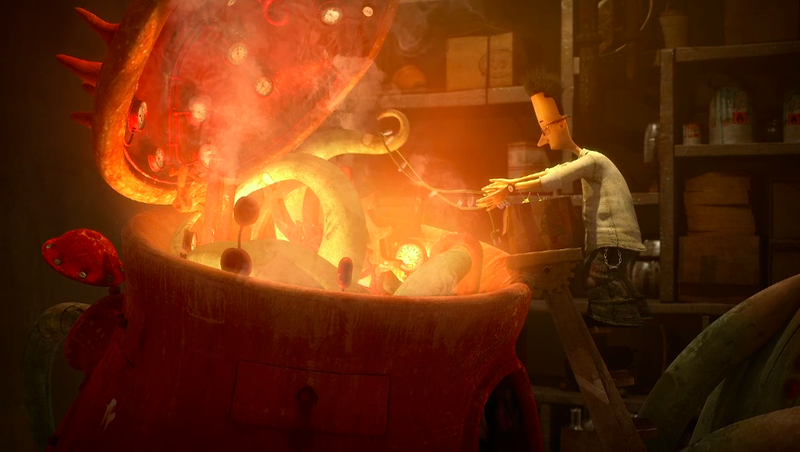 Based on the acclaimed picture books by co-director Shaun Tan, this sprightly, multifaceted short defies easy interpretation. The modest runtime doesn’t exactly allow its numerous weighty themes to be explored to completion, but sufficient mysterious beauty permeates throughout to ensure the film remains fresh and compelling upon repeat viewings. A strange, stunning gem, and one of the most striking Australian animated shorts of recent memory. The transfer is an anamorphically enhanced 16:9 widescreen, and it’s truly superb. Not only is the animation itself world class, but the picture quality is faultless and colour palette, when it comes into play, vibrant beyond belief. The multitude of imaginative mechanoids that inhabit this odd alternate reality are pretty genius too. The principal audio track is a 5.1 surround which effectively highlight both Minchin’s narration and Michael Yezerski’s brooding, accomplished score. As is to be expected with a feature running a quarter of an hour, the set is crammed with all manner of bonus features. The handsome cardboard packaging houses not only the film itself, but a great tie-in book from Tan entitled ‘Which Miscellaneous Abnormality is That?’ – a hardcover hand drawn compendium of weird and wondrous creatures including the ‘narcoleptic fable furnace’ and the presumably insatiable ‘luminous sugar seeker.’ On the disc itself we have separate audio commentaries from Tan and fellow director Andrew Ruhemann, Deleted Scenes, Featurettes, comparisons with the book’s original artwork, insights into the CGI, an interview with Tan and more. A bumper haul, and an excellent companion to the film itself.